Posted on October 4, 2018 by Joel Henthorn in Uncategorized. Posted on October 2, 2018 by Joel Henthorn in Uncategorized. Posted on August 22, 2018 by Joel Henthorn in Uncategorized. Posted on March 17, 2018 by Joel Henthorn in Uncategorized. 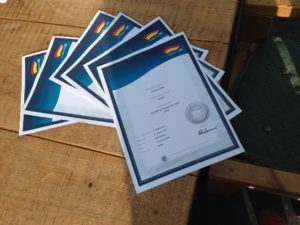 Certificates have arrived for those who completed the First Responder Qualification with the club. Massive thanks for those who give up their time to help make our beach and community a safer place. Well done Andy, Dan, Katey, Paul, Vickie, & Jack! Posted on December 9, 2017 by Joel Henthorn in Uncategorized. Community Lifesaving Project featured on Radio 4! Posted on August 29, 2016 by Joel Henthorn in Uncategorized. Recognition for the positive effect of our community lifesaving project on sea safety on BBC Radio 4’s Broadcasting House: http://bbc.in/2bR3Fx4 Includes sea safety tips from two of our Junior lifeguards; Lloyd Stein and Alfie England. Broadcast to an audience of just over 2 million!